On the Monday after the Regional, I proudly put our trophy up on the front office counter along with the certificate. 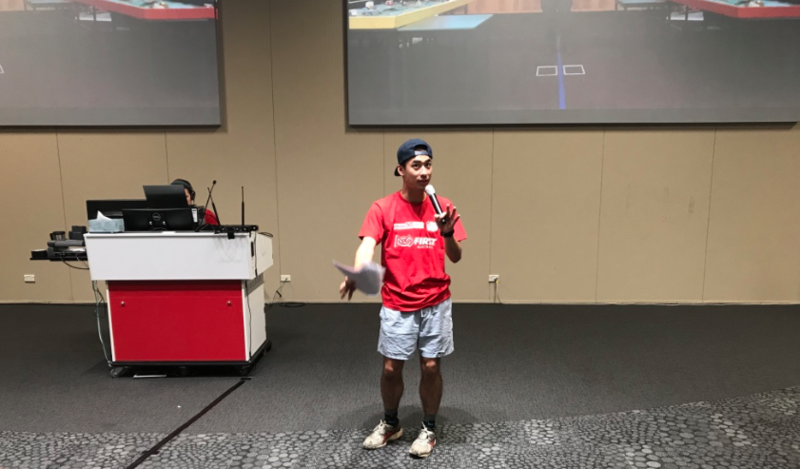 Whatever happened next, our first FLL outing had a tangible memento of that team's success.But we had decisions to make - would we take the team to the Sydney National Championship? First of all, I have to find out if the families would commit to the idea first. I drafted a letter to send home, setting the minimum response at six students to make the trip viable and asking for a commitment (if funding was available) by Wednesday. Immediately, two students informed that they would not be able to be part of it as their families had already committed to overseas trips to visit family in Korea and India respectively that departed prior to the Championship dates of December 2 and 3. I wasn't that hopeful. Then an email lobbed in my inbox on Tuesday morning that set a deadline by the end of the week to either confirm our place or release it for a wildcard entrant. A few team members visited me in my office with pleas to "make it happen" - they were still flushed with success and even with the whole venture totally unconfirmed continued to practice and perfect robot coding missions. A couple of Splice Cube members offered moral support and advice as well which was really appreciated. On Wednesday, six forms came back to me meaning that families were supportive of seizing the opportunity. By Thursday we had secured funding for the trip and so I excitedly sent off the confirmation that we would indeed be heading to Macquarie University! After securing tickets and accommodation, the team ran through all of the crucial things that needed to be organised and fine tuned before the next weekend. The coding missions were refined and the script for the presentation modified for fewer participants. They decided to stick with "simplicity is the key" robot design and we packed some attachments and spare parts into a ziploc bag, padded the robot for the trip and added some spare batteries. Notes were sent home and permission forms gathered in readiness for the early flight out of Adelaide the next morning. We flew out of Adelaide at 6.00 am and got into Sydney at around 8.30 am local time. We secured a Maxicab for the trip out to Macquarie and the driver took us over the Sydney Harbour Bridge. We were quite early so headed over to the local food court to eat some "brunch". We then joined the massing teams near the registration area - there were teams from state schools, quite a few private schools and some homeschooled teams. There were teams wearing their school uniforms and others like us in their customised team t-shirts. There were teams who were carting in large black plastic crates filled with robots and attachments. By comparison, when it rained later on, our robot fitted in a plastic shopping bag! Once registered, we found our pit area which was a lot smaller than the spacious room we had shared at Novar Gardens. There was certainly no room to spread out so I was glad that I didn't bring our game mat. We looked at our schedule and just like the Regional, we were super fortunate to have a great run. Everything was well spaced out - the first thing was the Research Project which the kids agreed would be great to get out of the way and minimise the length of time battling nerves. This was followed by Robot design and then Core Values which the team was really, really confident about. Then we would have our three Robot games, one mid afternoon, one early evening and then the final mid-morning on Sunday. It was time to head over to the opening ceremony. There were 68 teams at the Nationals, plus volunteers adding up to around 1200 people at this event which meant that the Opening Ceremony was held in two theatres at the same time, with any spectators watching a live stream in a third theatre. Each team were allocated coloured wristbands that sent them to a specific theatre - we were off the the Lotus Theatre which would house about a third of the participants while the Macquarie held the majority. The hosts took it in turns while being broadcast on the screens behind them. As seems to be the case with Lego events, it was high energy and dynamic, building up the excitement for everyone. The ceremony took longer than we expected and we nervously watched the time tick up closer to our 1.00 pm start time for our Research Project. We raced out of the theatre with ten minutes to spare, grabbed the props and pounded up two flights of stairs to get to the right venue .... but the judges weren't there yet! They were still on their way back from the theatre so the team calmed themselves. This was held in a lecture theatre and at the coaches' meeting we were told to be respectful of how many visitors and family members we were bringing to watch as to not interfere with the judges' job. That wasn't a problem for us - our audience was a total of one person, Casey, an upper primary teacher from PNPS who was generously giving up her weekend to be our female staff member on duty. A judge arrived and the students got started with their presentation on water contamination only to have the second judge join his offsider a few minutes in. The team took it all in stride and were done in around three minutes, possibly indicating that the research project needed more depth. Time seemed to move very quickly and it was soon approaching time for Robot Design judging. With our key coder in India, his compatriots had to step up and explain the coding choices while the others talked through their design choices, their mission strategy and demonstrated some of the missions with the robot. This was good because they were relieved to see that the missions that worked so well back in the STEM room at school looked like they would yield similar results here in Sydney. A couple of missions went a bit awry so immediately after the session concluded, a couple of times were booked for later on the practice tables. Shortly afterwards, we moved over to another building for the Core Values activity. All weekend long, all of the team members talked about this area being their strength, how they got on so well together, how they complemented each other and communicated to others. They were certain that with this chemistry that I also could really feel, that they would do well. And they did. The challenge was a simple one - a scenario of a flooded neighbourhood and six items that could be of use in such a disaster. Unanimously decide and justify which item would be kept within two minutes. They astounded the judges when they came to consensus in under forty seconds! They justified their choice clearly, and spoke like a team, finishing each other's sentences without interrupting - it just showed through that they were all on the same page. They answered some questions about decision making and choices within the context of the team and they were finished. "I think we nailed it", said Anna, our youngest member. The Robot Game setup was pretty much the same as the Regional but in a much larger theatre with more hype and overhead cameras broadcast on the screens behind. The first game scored 50 points which was no disgrace but we could see some of the more advanced teams scoring in the 200 - 300 point range. A lot of these teams were using box robots that could handle various types of attachments, and could sweep down the game table covering numerous missions before returning to base. Not really knowing much about robot design prior to becoming a coach, I could see how teams with multiple years of experience can build on their prior robot and can continue to work on the design even during the "off season". After all, even if the theme and missions are different every year, what the robot is being asked to do can be predicted and designed in advance. The missions dictate that a robot can push, lift, pick up, move objects, flip, rotate, push down, release and so on. Even with a couple of year's experience, a team could build a robot that can be readily adapted to the requirements of a new theme. YouTube is full of videos shared by FLL teams from all over the world so there is no shortage of inspiration and concepts to try out. The rain came down mid afternoon and we dodged showers to head back to the food court for a late lunch/early dinner. The team was in great spirits and I had managed to livestream the first round to the school FaceBook page. As we ate our food, I checked some of the comments and found Vedant, the team member who had gone to India just a few days prior had watched the footage, and offered strategy and words of advice to the team. This was fantastic and again, spoke to how bonded together the team was. He offered tips on how to improve the next round through improved positioning of attachments and so on. ... remember one slight movement in the position will change the whole missions success rate. The second round was at 6.30 pm and things went well for a new high score of 70. 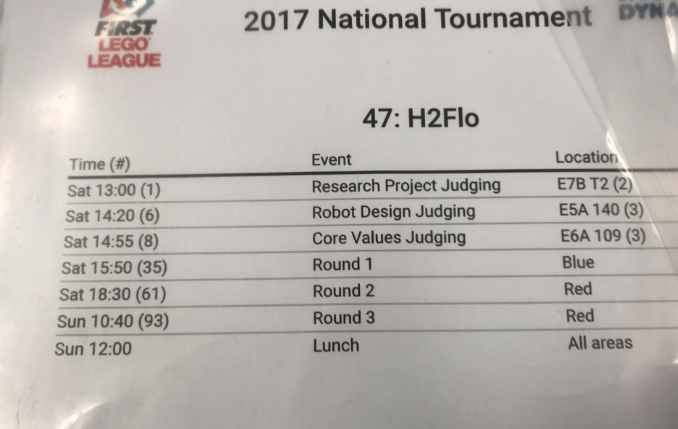 Remembering that the original goal was any score above zero and that H2Flo were really using a "booklet robot" with precise coding based on wheel rotations and exact starting spots, this was a good effort. It didn't matter that we were ranking in the 50's because we knew our strength wasn't robots - but that still was the fun part. We put the robot back in its plastic bag, tidied up our pit area and then caught a maxicab to our accommodation at Mantra Chatswood. The rain from Saturday's afternoon and evening were gone by Sunday morning which was cloudless and sunny. After fuelling everyone on toast, we packed up and headed back to Macquarie University for the second day. Everyone was relaxed and that might have been why no one checked the robot very closely prior to our final Robot Game, which turned out to be a sticking point when the pressure of the "1, 2, 3, Lego" start commenced. The final round stalled when the robot wouldn't move - the culprit was loose cables but after a bit of freaking out and getting one mission complete, things fell apart rapidly for a 10 point final score. Luckily only the best round counts, and lots of teams have at least one bad round. We stayed to watch some of the other teams including the amazing Project Bucephalus whose robot scored a mind boggling 390 points. And the cool thing was that my team weren't intimidated by this - they were inspired! We then packed up the pit area fully and then headed back over to the food court again for an early lunch with plenty of time for the Closing Ceremony. Again, this was back in the Lotus Theatre with live crossing back and forth from the Macquarie Theatre. There was dancing and a high five line and plenty of celebrating when they announced that all teams would be getting FLL medals for making it to Nationals. 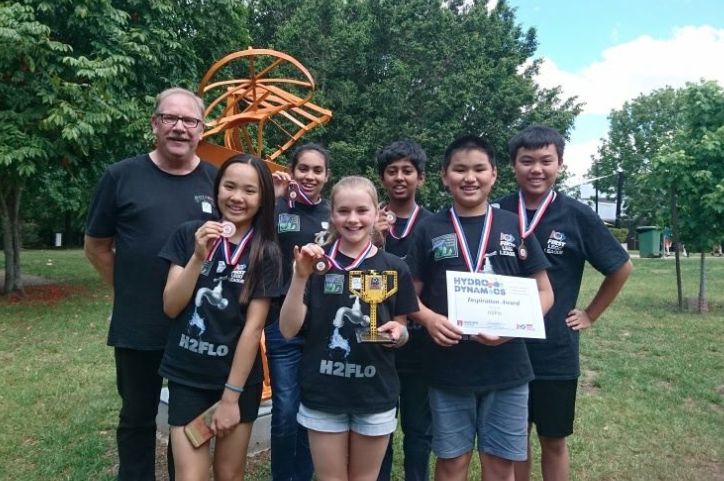 When over 680 teams who participated in First Lego League from all over Australia, being in the top 10% was quite an achievement for all National Championship teams. They then listed out the trophy categories and the winners, second and third place getters. With 36 trophies being given out, we were optimistic that maybe, just maybe our good fortune might continue. And it did ... with a Third Place trophy in the Inspiration category, a sub branch of the Core Values part of the competition. Turns out H2Flo's instincts about the team chemistry were very accurate. Then it was all over very quickly, and it was time to get back to the airport, catch the plane and greet some very amazed and justifiably proud families back at Adelaide Airport. Posted in Programming, STEM on December 13, 2017 by Graham.